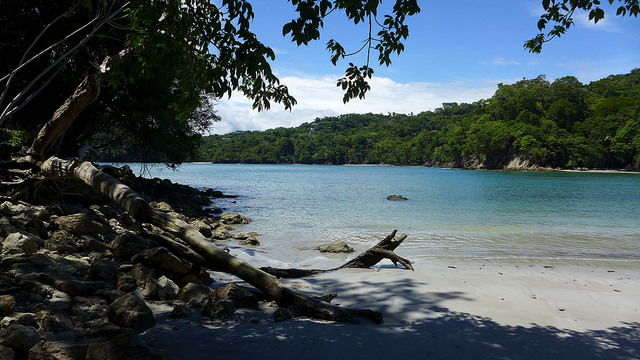 Manuel Antonio region, it’s one of the most complete destinations of Costa Rica. It has gorgeous beaches, a very active rainforest, lots of wildlife sightings and a fantastic array of accommodations, activities, restaurants and all sorts of experiences for any traveler. Manuel Antonio region is located in the Central-South Pacific region of Costa Rica, in the province of Puntarenas. 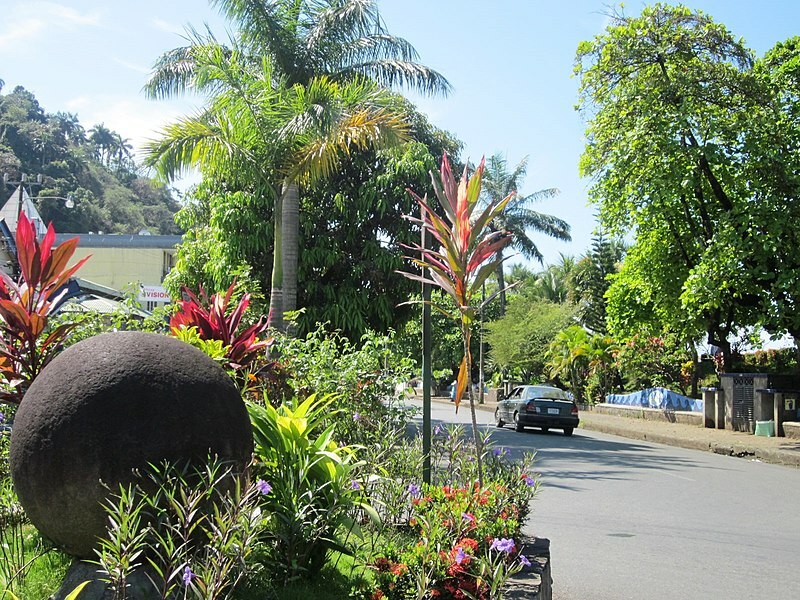 The main town is Quepos, followed by the community of Manuel Antonio, on the road to the National Park. 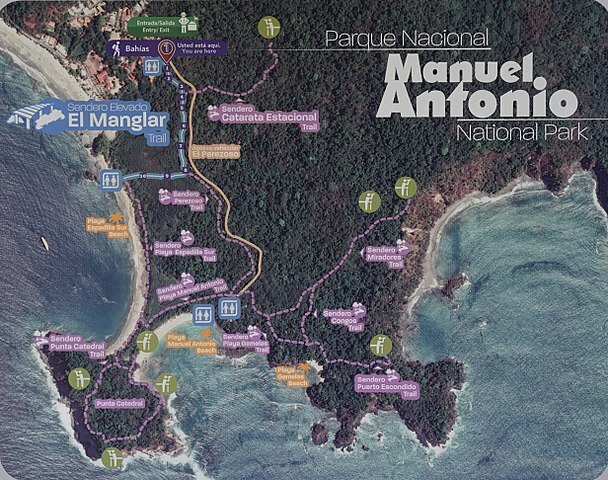 How to get to the Manuel Antonio Region? You can get there either by car or by air. The distance from the Juan Santamaría International Airport (SJO) is 154.19 km, 95.81 mi. And from the Liberia, Daniel Oduber International Airport (LIR) is 248.92 km, 154.67 mi. 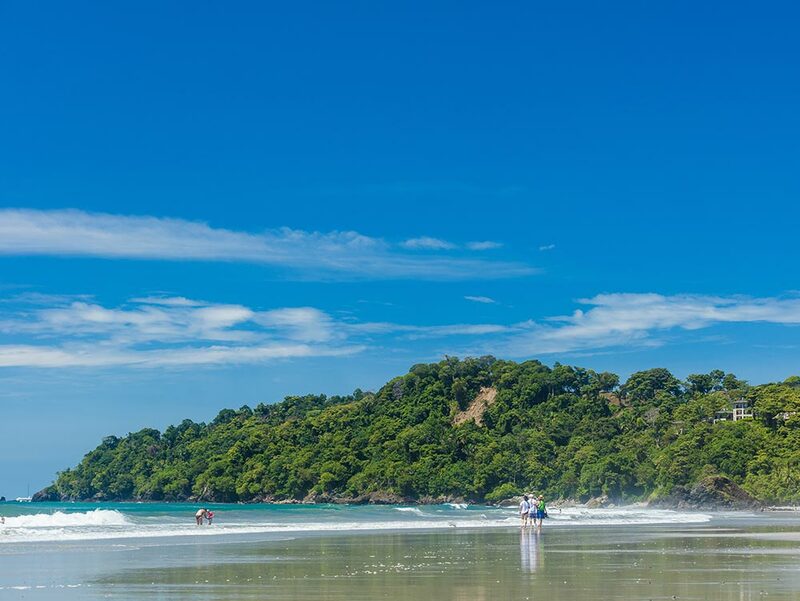 Manuel Antonio Region is divided into five areas Manuel Antonio town and road, Biezans Beach and road, Espadilla Beach, the National Park, and Quepos. Quepos, in the Manuel Antonio region, is an international port that was found by the banana company for exports and the most important population center in the Manuel Antonio region. 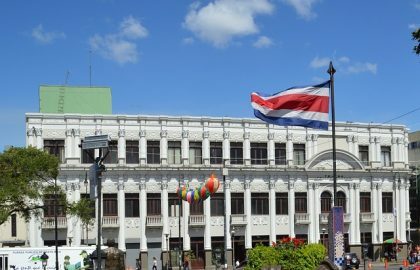 It’s a bustling town with all types of restaurants, stores, and a Central Market with good and affordable typical Costa Rican meals. It also has an international cruise ship port and a marina for small yachts, sailing boats and catamarans. And an airport for local flights. As you exit the city of Quepos, you will start driving on a winding road that’s about 7 kilometers. This road is immersed in nature and you may easily see monkeys, sloths and other mammals. This is also the area where you will find the majority of the hotels, several restaurants, nightclubs and some of the most popular tour operators as well as banks, grocery stores, and all sorts of shopping options. Some of the most recommended hotels are on a detour from this dirt road, as well as the snorkeling bay, Biesanz beach. 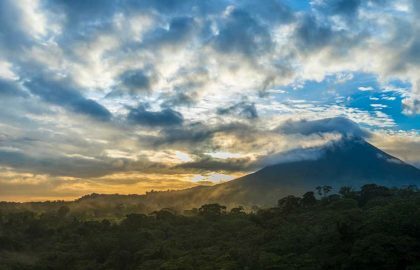 You will find amazing views in some of these accommodations, as well as breathtaking rainforest panoramas. These are the most popular areas in the region. 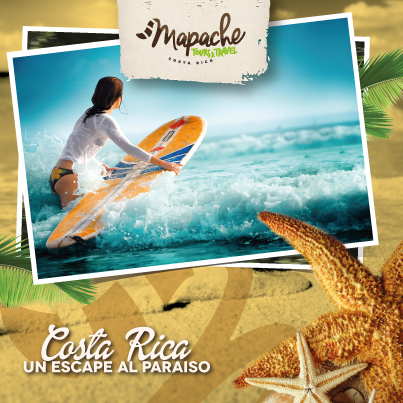 It’s where the beautiful beaches are as well as the entrance to the smallest and most famous National Park of Costa Rica. The beach goes for around 2 kilometers passing by several restaurants and bars, and at the very end, you will find a couple of hotels and the entrance to the park. In The National Park you will find several beaches, however, the main one is called The Third Beach and it’s at the very end of the entrance road to the Park. 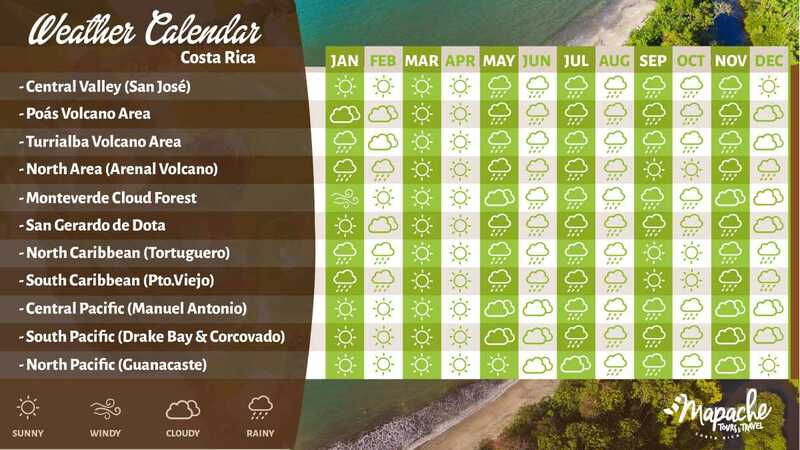 As you can see in the chart underneath, however, there are several trails to awe at the fantastic wildlife of the region and if you like and are a good hiker you can also try other beaches as Gemelas or Puerto Escondido. The city gets its name from the original inhabitants of the region: The Quepoa. 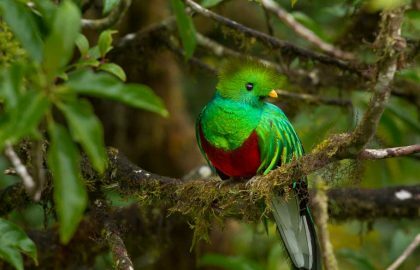 A subgroup of the bruncas or borucas who still inhabit the Southern Mountains of Costa Rica. It was recognized by the Spaniards first than any other region in the country. And several Spanish documents and letters are talking about this place. As well as several pirate incursions. (More to hide than anything else). For hundreds of years, it was just left alone and the remaining indigenous inhabitants. One talks about a man who used to live in the area and the other one it’s about a Spanish conqueror who was killed and buried in the region. And Manuel Antonio gets into bananas. Towards the end of the XIX Century and with the banana fever from the Caribbean small banana plantations began to appear and later on as the United Fruit Company had issues with diseases and workers strikes, they end up buying all the banana fields in the Central and South Pacific coast of Costa Rica. 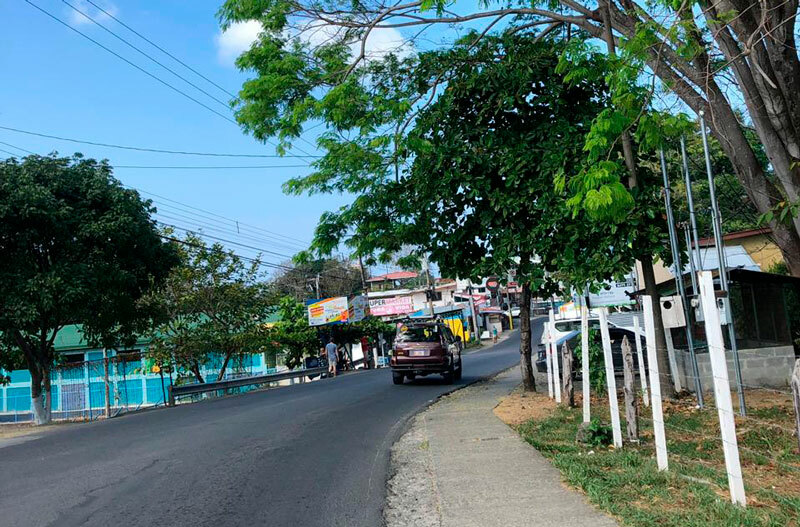 From Parrita to the border with Panama. This area became known at first as a banana exporting port. Due to a fungus banana disease, in the 1980s African palms substituted bananas as the main crop and, because the finished product is lighter for transportation, Quepos weakened as a critical shipping port. From the 1950s to late 1990s the coastal road was a still a dirt way surrounded by pastures, forest, and palms. The bridges were wooded or made of old railroad tracks, and there was a general sensation of abandonment in the region. The region of what is now the National Park had different owners throughout time. And the last property holder was a French man that didn’t allow locals to swim in the beaches and enclosed them with fences and guard dogs. 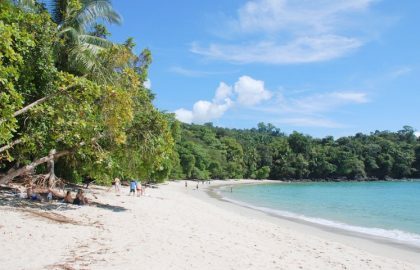 Because of this arbitrary decision, in a country where beaches are public, and after a long struggle the government created the Manuel Antonio National Park in 1972. And expanded it in 1980. As tourism starts in the Central American region. 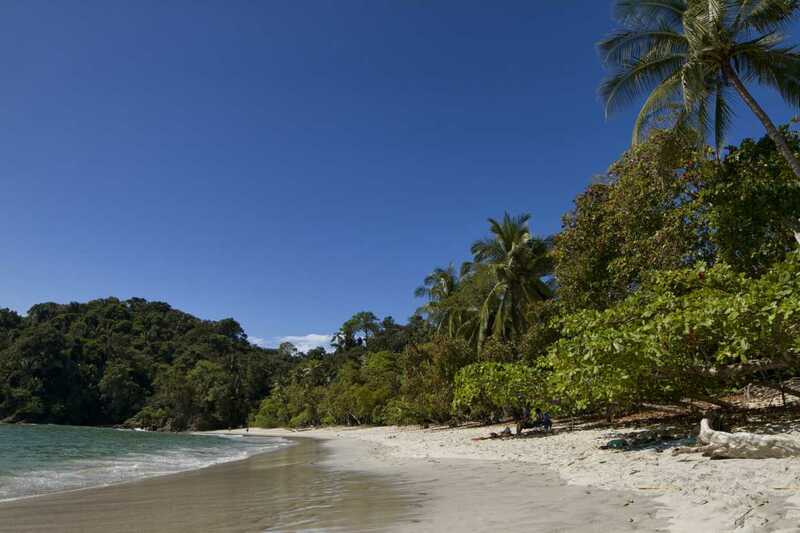 Quepos and the Manuel Antonio National Park began to have prominence. In the 1980s, the first flights from Sansa start arriving, and a few hotels opened. The National Park was open for camping, and the region was visited mostly by backpackers or gay tourism who found an isolated haven where they could have some relative freedom. When the XXI Century arrives, the travel industry had already settled in the area. The region nowadays counts with many choices for accommodations and activities. The weather, all year round is hot and humid. As you can see in the chart below, half of the year, from November to May it’s sunny and the rest of the year is rainy. But it mainly rains for a few hours at the end of the day or night. The Manuel Antonio region has a great sort of hotels and, it depends on what do you want on which is best for you. The first statement to say, though, and it’s important to acknowledge, there are very few hotels right on the sea. Mostly all hotels are on the roads up on the hill, surrounded by rainforests, with teeming wildlife and amazing views. There are a couple of high- end choices that have their small secluded beaches (Not private as it is illegal in Costa Rica to fence a beach). On the other hand, some of the hotels right on the edge of the sea might be as well very affordable. But, mainly, know that some of the most beautiful and comfortable accommodations of the region are about the views and the surrounding forest and not about the beach. Some of them use periodic shuttles. There are selections for all types of budgets, from the backpacker’s hostels in Quepos, to small family owned “cabinas” and breathtaking five stars resorts. 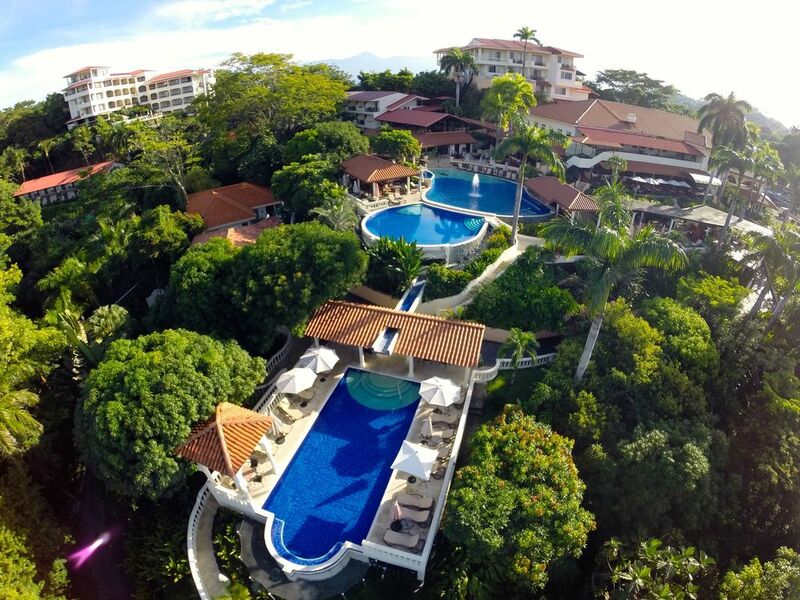 It truly depends on the purpose you’d like to come to Manuel Antonio to choose the hotel for you and your party. Ask our travel consultants as they do continuous inspections in the region and know all hotels personally. There are also pet-friendly, LGBT resorts and adults only options. 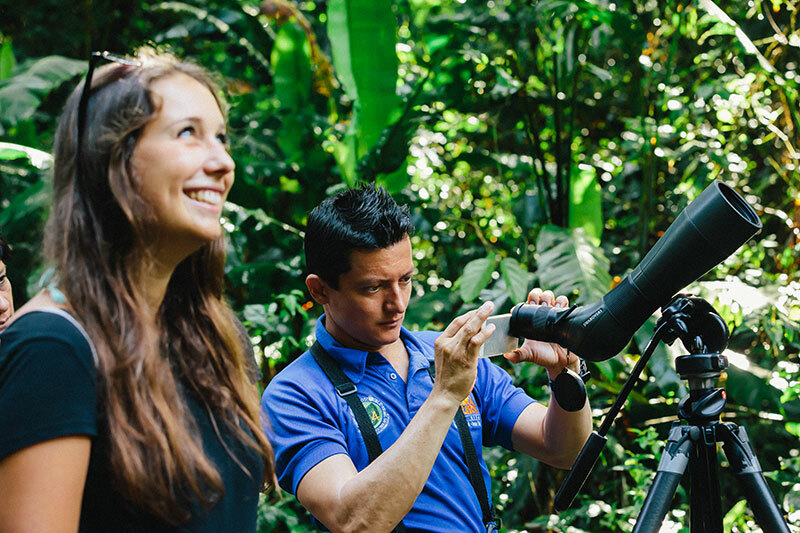 As the rainforests of Manuel Antonio are pristine and beautiful and the National Park is as small as it is, the activities to see its fantastic nature concentrate easily in the region with a few exceptions. 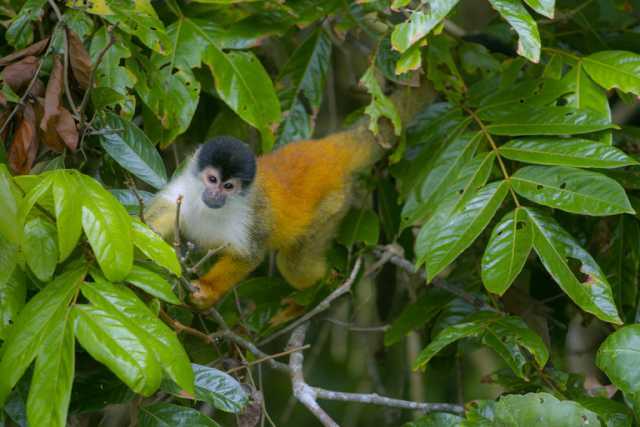 In the area there is abundant wildlife and as the rainforests are quite concentrated in a small piece of land, you will be able to see: howler, white-faced, spider and squirrel monkeys, two and three-toed sloths, toucans, two types of iguanas, agouti paca, coatimundis, and sometimes, American crocodiles and spectacled caymans, among other amazing creatures. 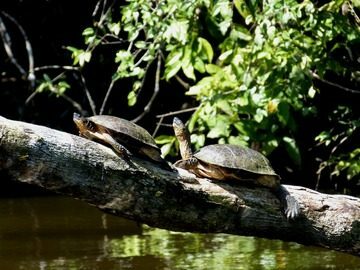 You may find several choices on hikes, from very easy to strenuous, as well as night and day tours through the forest. In terms of the National Park hikes, you may have morning and afternoon possibilities. Highly recommended to ask our travel consultants to advise you about the best times for the tour and recommend one of the region’s excellent tour guides with optical gear to watch the wildlife up close and personal. There are also waterfalls lost in the middle of the rainforest, hot springs and great safaris in mangrove forests, by boat or kayak. You may also want to enjoy the sea sailing trips to see dolphins and whales as well as to delight in the beautiful small fish in the snorkeling experiences. 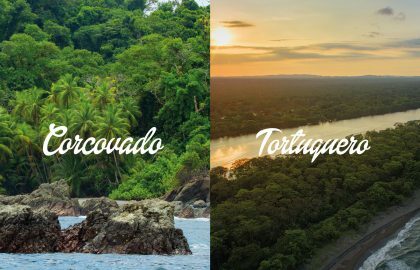 In Manuel Antonio, you can find a couple of lovely tico experiences, where you will see the farming, the food and the friendly manner of the Costa Ricans. 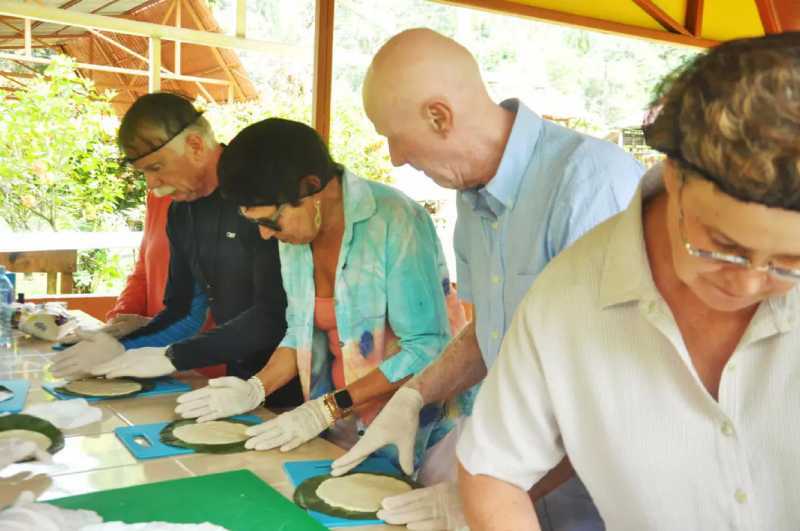 You can also get to know a bit of the indigenous traditions of the remaining Boruca indigenous population in Manuel Antonio Region. 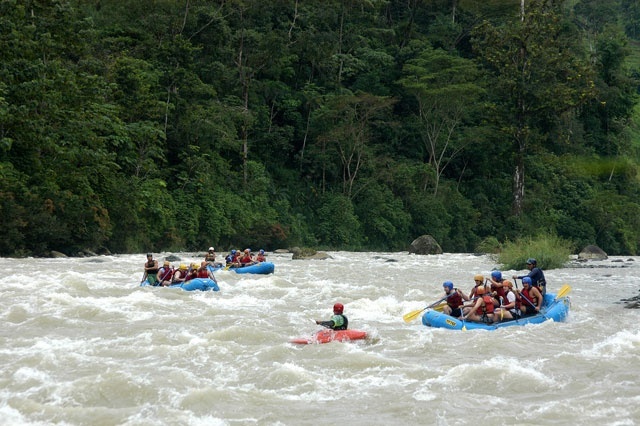 In Manuel Antonio, you can find several choices for great rafting in the most pristine forests that you’ve ever seen. The water is warm, and the landscapes are breathtaking. As well you can also find breathtaking ziplining choices and sea and mangrove kayaking. The Manuel Antonio Region, as we said previously is a very complete destination and ideal for family or friends’ vacations. 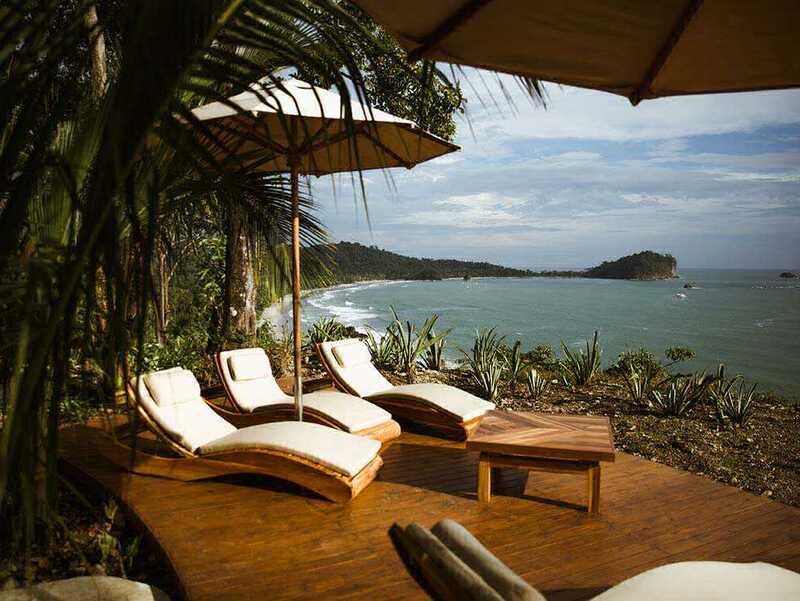 Please ask our travel experts for these and other choices in this super famous Manuel Antonio Region. Monteverde Region, all you want to know about it!